So far as we know now, the first river valley to produce large-scale agriculture and the first civilization was that between the Tigris and the Euphrates rivers in modern-day Iraq. Sometime around 3500 B.C. the first city-states emerged on the plains of Sumer, just north of the Persian Gulf. In this forbidding flat plain, people first raised great cities, built around huge temples, called ziggurats, which reached to the sky like the fabled Tower of Babel. In the Land Between the Two Rivers, or Mesopotamia as the Greeks would later call it, the ancient Sumerians discovered the adaptive advantages of organizing such large-scale coordination of human activity. In the process, they laid down the patterns that would be followed by all future Mesopotamian peoples. The earliest record we have of civilized life is found in the region traditionally called the Fertile Crescent, an arc of land running from the head of the Persian Gulf north to the mountains of southern Turkey, west to the Mediterranean Sea and then south along the eastern Mediterranean coast. 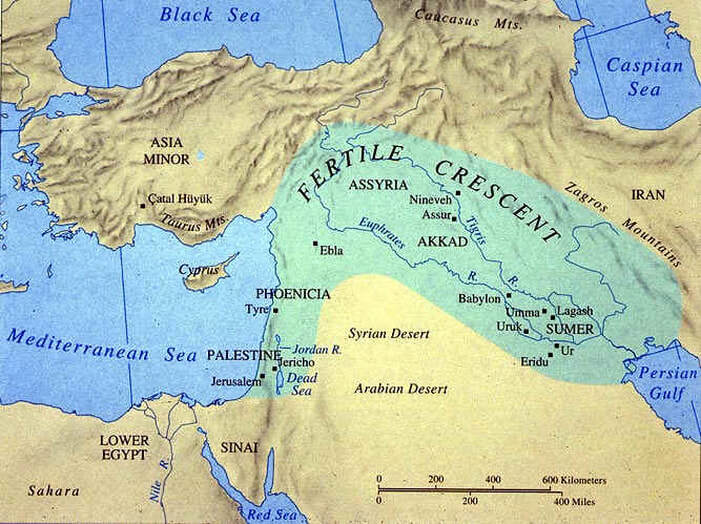 The crescent thus encompassed all the fertile rain- and river-watered areas suitable for agriculture that bordered the great Syrian Desert. The most important land in this region lay between the two great rivers, the Tigris and the Euphrates. From their sources in the highlands of eastern Turkey, the Tigris and Euphrates flow southeastward towards the Persian Gulf. To the east lie the Zagros Mountains and beyond them the great Iranian plateau, with its high deserts. To the west, beyond the reach of the Euphrates' banks, lies the Syrian Desert, which in turn reaches south joining into the deserts of Najd in central Arabia. In their northern reaches, the region traditionally called by the Greeks Mesopotamia, or Land between the Rivers, the Tigris and Euphrates are separated by as much as a hundred miles. About halfway down their length, the two rivers come within about thirty miles of each other, in a region known as Akkad. Further south they spread out again, in the region traditionally called Sumer. Finally, as they near the gulf the rivers come back together. They join in what today is called the Shatt al-Arab, a single great waterway that flows through soggy, reed-filled swamps until it reaches the sea. The great advantage of farming along the Tigris and Euphrates is the fertility of the soil. This fertility is due to the annual flooding of the rivers, which brings rich silt down from the highlands and deposits it along the river valleys. The annual deposit of silt, particularly in the Euphrates, is about five times greater than that in the Nile River valley. In the southern region, Sumer, the silt builds up. Frequently this causes the river to overflow its banks, sending floodwaters swirling unpredictably and destructively across the land. As rich and productive as the soil might be, therefore, it could only be used effectively by farmers after they had dug canals and dikes to control the floodwaters, channeling them to the fields. Such projects required intense coordinated labor. Out of that cooperative process the first civilization emerged from the dawn of prehistory. Sometime between 4000 and 3500 B.C., a new people migrated into the southern valleys of the Tigris and Euphrates Rivers, where they flowed into the waters of the Persian Gulf. At the time, the Persian Gulf stretched much further north than it does today, and the two rivers had not yet merged into the single watercourse that we know today as the Shatt-al-Arab, but flowed separately into the sea. We do not know where these people came from--perhaps the hills of Iran or Turkey to the north, perhaps even from the sea itself. Nor do we know to whom they were related, for their language is unlike that of the other peoples living in this region. Yet while their origins may be shrouded in the mists of time, their impact on all subsequent civilization in Mesopotamia can hardly by overestimated. They brought with them skills of organization and cooperation needed for large-scale irrigation farming. These skills would help to change the course of human history. For it was these people settling in the region of Sumer, and hence called Sumerians, who created the first true civilization we have so far discovered. Initially the migrants settled in small agricultural villages along the banks of the rivers. Small communities had little chance of controlling the floodwaters, however, and many villages eventually banded together. Before long they had become towns. With growing surplus food supplies, the towns themselves expanded and by about 3500 B.C. the first true cities had appeared in Sumer. As the cities themselves continued to grow, however, they soon began to compete for water and other resources. Water competition must have been particularly fierce in times of drought, as cities upstream diverted the precious waters of the rivers into their own fields leaving cities further downstream high and dry. It was almost certainly due to this kind of life and death competition for resources that for most of its history Sumer never became a single, unified country. Instead it remained a land of independent city-states – local communities of several thousand inhabitants living in protected walled cities surrounded by the fields and orchards they cultivated for their primary food supplies. 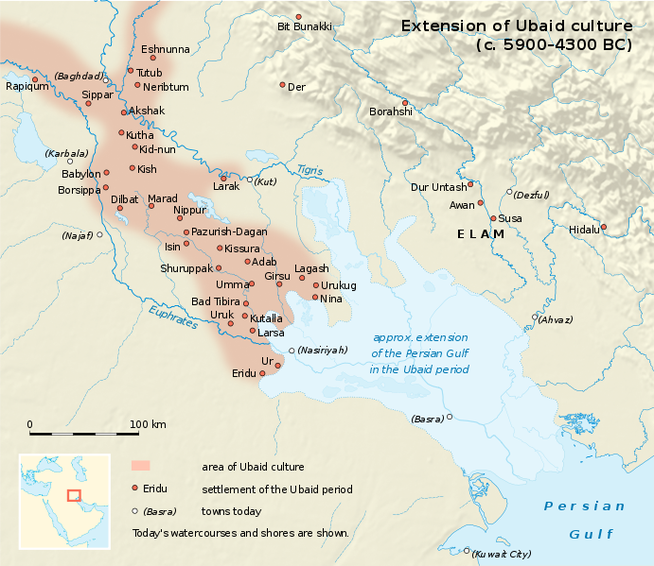 Irrigation Agriculture and Sumerian Civilization. The organization required to dig canals and dikes along the Tigris and Euphrates produced a greater level of specialization within the workforce than had occurred in the later Neolithic towns. To be effective, irrigation efforts had to be carefully planned by people who observed the flow of the water from year to year. Such people understood where the dikes and canals should be placed for maximum effect. At the same time, the dikes and canals themselves, channeling millions of gallons of water, had to be constructed sturdily and efficiently. This process also required the development of specialized skills in surveying and building. Once the water had been brought to the fields, of course, it was also important to know the best times for sowing, weeding, watering, and ultimately harvesting. This too required experience and knowledge, particularly of the seasons and the weather. Those who had such specialized skills and knowledge would naturally have emerged as the leaders of Sumerian society. The role of these specialists, however, also reflected the general Sumerian conception of how the universe worked. As had been the case in the Neolithic farming communities, the ancient Sumerians apparently believed that the natural world was essentially alive. Sumerians saw natural forces like lightening, rain, wind, thunder, and so on, as the physical forms of unseen spirits. They believed everything was inhabited by a spirit or god that gave it its shape and function, even the rivers, canals, reeds, and water. Quite naturally, since the specialists were dealing with the forces of Nature, these leaders of Sumerian society were also probably seen as intermediaries with the spirits that ruled the natural world - in other words, the gods. Thus they were not only agricultural specialists and engineers, but also priests. Indeed, the earliest rulers of the city-states appear to have been the ensi, or chief priests, who organized and oversaw both the general agricultural activity of the city as well as the worship of the city's chief god. This combination of spiritual authority with the practical knowledge that allowed Sumerians to feed themselves determined the overall character of early Sumerian culture and society. At the heart of this culture was a religious worldview that directly reflected the environment from which it had sprung. Sumerian religion. From the beginning, human history in Mesopotamia (as the whole region between the two rivers has come to be called) has reflected the nature of the land and climate in which it developed. The land is harsh, and the climate violent. 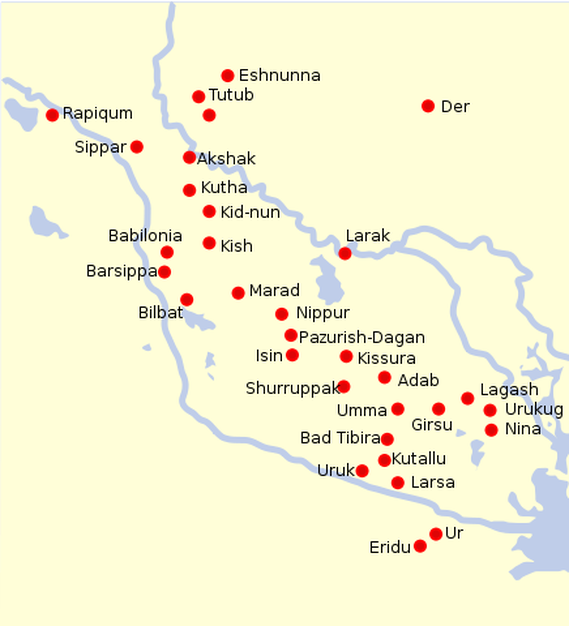 For example, there are probably more lightening strikes in Mesopotamia per year than in any other region of the world. Thunderstorms and unexpected floods, killing dust storms and long months of drought, these are the elements of nature with which the early peoples of the land between the rivers had to struggle for survival. As might be expected, the violence of the climate and the harshness of the environment greatly affected their outlook on life in general. Although they had begun to depend on agriculture for their livelihood, Sumerians remained subject to the forces of nature. The Tigris and Euphrates were especially unpredictable rivers; some years they might be reduced to a trickle, others they might experience sudden, violent floods. As the early settlers in the region began to develop their cooperative skills, they also appealed to the spirits and forces of nature on which they depended. Sumerians naturally believed that these gods and goddesses were just as cruel, unpredictable, and violent as the natural forces that embodied them. Their gods like their environment were harsh and unpredictable. The whole character of Mesopotamian civilization thus became pessimistic rather than optimistic. With so much of their livelihood dependent on natural forces, Sumerians also came to see the gods and goddesses associated with them as the true rulers of their own lives. Under the leadership of the priests, people saw their cities as the property of particular deities. Indeed, the city became in a sense the embodiment of the god. When cities fought one another, Sumerians believed, it was because the gods were fighting. When cities cooperated (a rare occurrence), it showed the gods were friendly. They explained every aspect of existence with reference to the gods. Who were these gods? The father and king over all the gods was Anu, a sky god connected with lightening and thunder, whose city was Uruk (Erech in the Bible). Associated with him was Innana, the Mother Goddess and Queen of Heaven, who would later be called Ishtar or Astarte. 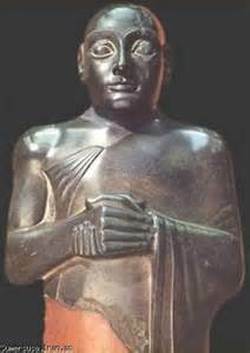 In later days Inanna would be even more important in Uruk than Anu. In fact female deities were extremely important in this civilization that depended upon agriculture and the fertility of the soil. In the city of Nippur they worshipped the god of the air and life on earth, Enlil, and his wife Ninlil. The sun god Shamash held sway in the cities of Sippur and Larsa, and in Lagash dwelt Ningirsu. The people of Eridu worshipped Ea, the water god. Ea's son Marduk later became the chief god of the Babylonians, and fed upon the first-born sons of the city. Great Ur belonged to Enlil’s son, Nanna (or Sin), the moon god, whose phases were studied by the priests and seers to foretell the future as well as when to plant and when to harvest. Not least, in the city of Borsippa they worshipped Nebo, the Scribe, who recorded the decisions and deeds of the other gods. In addition to these greater gods, Sumerians also worshipped their own lesser, personal gods who could theoretically intercede on their behalf with the greater gods. Sumerian Social Structure. The initial association of religion and irrigation agriculture led to a three-fold social structure in early Sumerian cities. At the top of an increasingly stratified hierarchy were the priests, en or ensi (chief priest), whose service to the gods the Sumerians believed to be critical to insuring good crop yields, and hence survival. Associated with the priests, and perhaps part of the same general category, were the administrators who oversaw day-to-day functions of the city. Next came artisans and merchants. Artisans made the specialized items required by the rest of the community. Merchants traded with neighboring cities or with people in far away regions for products like salt, wood, stone and metal ores that were unavailable locally. Finally, the third category consisted of agricultural laborers and slaves. These workers of the fields actually did the essential labor necessary to feed everyone. But the Sumerians apparently believed they were merely the hands and feet of the community. The real prestige of Sumerian society lay with those who were responsible for organizing the activities of workers - the priests and administrators. The Sumerians reinforced the hierarchical nature of this social structure by assigning different levels of worth to each of the three classes. For example, the death or injury of a member of the aristocracy was a more serious offense than that of a peasant or slave. Such distinctions reflected the Sumerians' assessment of the level of contribution to the society as a whole made by any particular individual. This three-fold structure provided the basic framework for Sumerian society for its first five to eight hundred years. Sometime around the beginning of the third millennium B.C., however, changes began to occur within the Sumerian city-states that added a new element to the pattern. While service to the gods remained a primary aspect of Sumerian life, as the city-states became more prosperous a close second became the need for protection. Sumer’s increasing wealth, with its rich agricultural produce, sorely tempted surrounding peoples who had not yet begun to settle down to a farming lifestyle. Kingship. Mesopotamia, and particularly Sumer, is a great plain with few natural barriers. Access is relatively easy for travelers or invaders. Nomadic marauders found the Sumerian city-states prime targets for raiding and plundering. Moreover, as they grew, the various city-states also frequently fought among themselves over water rights and land boundaries. Consequently, in addition to the priesthood that served the gods, another important figure emerged in the city, the war-chief, or lugal, meaning "big man," who soon became powerful enough to act as a local king. Although ensi appears to have been the title used by city rulers in the earliest records of the Sumerian city-states, as warfare became a major factor in Sumerian life so the title of lugal seems to have superceded that of ensi in prestige and importance. As kings extended their power, often dominating more than one city, the title ensi came to indicate a local governor under a more powerful lugal. With a flair for economy appropriate to the region, the Sumerians eventually combined the role of king with that of chief priest. In addition to being a war leader, the lugal also became the one responsible for conducting the most important sacrifices to the city gods. He came to be seen as the representative of the gods to humanity. With such divine sanction, the concept of kingship became a central theme of Sumerian and later Mesopotamian civilization in general. For the Sumerians, the mark of a great people was that their city should be blessed with the authority of kingship. Those cities that lost the kingship, usually through having been conquered, were clearly out of favor with the gods and in decline - or so the Sumerians believed. What the king represented, of course, was security in an insecure environment. With the emergence of kingship, Sumerian society achieved the pattern that would ultimately become a blueprint for future Mesopotamian societies. The importance of kingship for the Sumerians can be seen in the Sumerian King List, an ancient text that was copied over and over throughout the course of Mesopotamian history. The earliest texts of the list so far discovered were created sometime in the early 2nd millennium B.C., but they describe events that can be archaeologically supported from at least the middle of the 3rd millennium B.C., and possibly even earlier. The original list was probably composed sometime in the late 3rd millennium and then periodically updated by later generations. Although modern scholars have used the king list as a framework for understanding the political history of the 3rd millennium B.C. in particular, they do so cautiously - the Sumerian king list was clearly a literary historical text that was periodically used, and possibly altered, to suit the political needs of particular Mesopotamian rulers anxious to establish their own legitimacy or historical legacy. In addition to the city-state and the whole idea of kingship, the increased level of specialization in ancient Sumer led to perhaps the single most important invention in the story of civilization - writing. As the cities produced more and more food, and specialized artisans produced their wares for sale, it became important to keep records. For one thing the priests, who did not produce their own food, had to eat. Yet their specialized knowledge was essential for maintaining the irrigation works on which everyone's food supply depended. Consequently, the rest of the community supported both them and the gods they served. Such support, either in the form of agricultural produce or a specified number of days of labor on fields belonging to the gods, was the first form of taxation. Records had to be kept in order to figure out how much the agricultural workers owed in taxes. As artisans began to produce their own products, they too had to provide support for the temples. Consequently, they too had to keep records to figure out who owed them what, and how much they in turn owed the priests. Writing thus developed out of the need for keeping records. The most recent archaeological evidence suggests that people in Mesopotamia and ancient Turkey may have been using rudimentary pictogram systems to keep track of goods and food supplies even before the rise of the first civilizations, but it was almost certainly in Sumer that the use of such symbols was developed even further to convey more sophisticated kinds of information. INTERNET RESOURCE Cuneiform Writing System Initially using as many as 2000 symbols, made by pressing a pointed stick called a stylus into damp clay tablets, which were then dried to preserve them, the Sumerians recorded the items that passed in and out of their storehouses. Because of the characteristic wedge shapes created by the stylus, modern scholars called the Sumerian style of writing cuneiform, from the Latin word cuneus, meaning wedge. Each symbol began as a pictogram, or picture of the item it stood for. Soon, however, the Sumerians developed their writing system so that they could do more than simply count. Their signs became associated with ideas. For example the sign for sun might also mean warmth, or light. Pictograms became more highly stylized, as shown in the chart below. The early pictograms and early cuneiform symbols each stood for a single word. By about 3000 B.C., however, the Sumerians had begun to use the signs to stand for particular sounds, generally syllables, which could be combined to make words and sentences conveying complex ideas. This development allowed them to reduce the number of signs eventually to about 600. It also made it possible for scribes, highly trained specialists who mastered the art of writing, to go beyond simple record keeping. You dolt, numbskull, school pest, you illiterate, you Sumerian ignoramus, your hand is terrible; it cannot even hold the stylus properly; it is unfit for writing and cannot take dictation. And yet you say you are a scribe like me! "Now, I swear by the sun god Utu on this very day—and my younger brothers shall be witness of it in foreign lands where the sons of Sumer are not known, where people do not have the use of paved roads, where they have no access to the written word—that I, the firstborn son, am a fashioner of words, a composer of songs, a composer of words, and that they will recite my songs as heavenly writings, and that they will bow down before my words......"
Shulgi, son of Ur-Nammu, and second king of the third dynasty of Ur, c. 2100 B.C. Sumerian Education. Writing was important for several reasons, but the most important had to do with the process of cultural adaptation. Once the Sumerians could write things down, they could pass their knowledge not only from person to person, but also from generation to generation. Knowledge could be stored like surplus grain, experiences could be accumulated much more effectively than in the days when only human memory and oral tradition were available to preserve the record of past successes and failures. The failures could now be analyzed and avoided, and the successes could be built upon. Recognizing the significance of writing, the Sumerians soon placed great importance on education, as well as on record-keeping. The schoolboy’s heart might well have pounded with fear – the normal punishment for tardiness was to be beaten with a cane. Writing and reading, of course, was only the beginning. Sumerian students also studied history, mathematics, map-making, even foreign languages; as they advanced they undertook law, medicine, and surgery. With the basic skills they learned in school, they soon developed and preserved other more advanced skills that we associate with great civilizations - skills in engineering, architecture, and science. Development of Laws. Writing also made possible another development that is still important to us today: written laws. With their highly stratified society, the Sumerian approach to law was also rather complex. Writing made it possible to keep track of the laws and to enforce them more effectively. Although the laws themselves certainly pre-dated the invention of writing, and were probably based on customs that had developed over the years to insure the discipline necessary to keep up the irrigation works, writing them down probably helped to fix in stone the divisions of responsibility and privilege within Sumerian society. Laws were necessary as a means of regulating the increasingly complex relationships among individuals and groups within the large populations of cities. Where in a village or town people would probably all know one another, and relations could be kept on a more informal basis, cities were simply too large and well-populated for such intimate contacts. Laws became necessary to help everyone know their place in society, and what was expected of them - in other words, laws helped people to establish their sense of personal identity within the larger community of urban society. Sumerian Technology. While writing was probably the most significant invention of the Sumerians, it was by no means the only one. As might be expected from the first civilization, with no past tradition or experience on which to rely, Sumerian inventions tended to be thoroughly practical. Certainly their technology developed out of the basic needs of an agrarian society. Moreover, as the first civilization to emerge, their inventions are still some of the most important tools that we use today. For example we owe the plow to the Sumerians. As part of their long-distance trade, they apparently also invented the sailboat, and the wheel, which originally came to Sumer in the form of a potter's wheel from the Iranian plateau, but which the Sumerians learned to attach to carts and wagons drawn either by people or oxen. Although not the first, they became greatly experienced in the production and use of metals, especially copper and later bronze. In a slightly different category are their inventions of a non-material nature. For example, as means of keeping a record of the passage of time, which was important for agricultural purposes like planting and harvesting, the Sumerians developed the lunar calendar, which counted time based upon the phases of the moon. Observing that the moon went from a thin crescent to a full moon and back to a thin crescent again in a period of thirty-nine and a half days, what we call a month, the priests noted that twelve such months encompassed the full change of the seasons. This knowledge allowed them to determine the best time to plant. Tracking the moon in this fashion also marked the real beginnings of humanity's efforts to understand and make use of the underlying rules on which the natural world operates. Still convinced, however, that the gods ruled Nature, both the Sumerians and especially the later Babylonians studied the orderly movement of the heavenly bodies, associating them with particular gods. They believed that these movements affected their own lives and observed them in order to predict the future, a practice known as astrology. Such observations, however, also became the foundation for astronomy, the observation and study of the heavens. Out of their practical need to count, for purposes of trade and agriculture, and as a natural extension of writing, the Sumerians also developed a number system and practical mathematical skills. They based their system of calculation on the number sixty, and it survives to the present day in many of our own modern measurement systems: as in the division of the hour into sixty minutes, and the minute into sixty seconds. Mathematical skills not only permitted more sophisticated counting, but also helped the development of building and architectural skills. The number of mud bricks required to build a house or a ziggurat, for example, could be calculated with great accuracy. Building on the Sumerians' work, later Mesopotamians, notably the Babylonians, made even further mathematical advances, dividing a circle into 360 degrees (a multiple of 60), and calculating the area of rectangles and right-angle triangles. All such mathematical skills, however, remained completely practical and based upon physical objects and relationships that could be visibly measured. Advanced or "pure" mathematics, based upon abstract principles, were not developed until the rise of Greek civilization. The ancient Sumerians established the basic patterns of Mesopotamian civilization, but it was left to others to preserve and extend them. Although the Sumerians learned to coordinate the activities of enough people to create city-states, the cities were never able effectively to cooperate among themselves to establish a larger political structure. This failure left the city-states of Sumer open to both internal conflict and to external invasion.